Well, after two weeks with my trainer, I got to go home for three days to relax and get ready for my company test. Before I can get assigned my own truck I had to go back to the operating center and take a series of tests so the company knows I am knowledgeable enough and safe enough to go out solo in my own truck. I had heard stories from other drivers about the testing, but was still going into it with an open mind. I was told I would take a road test, coupling and uncoupling procedures test, a skills test that included backing, a test on our Qualcomm , and the hardest from what I had heard was a trip planning test that would throw us for curves every time we thought we were done. I arrived at the operating center and checked into the hotel the night before. I wanted to make sure I got a good night sleep for the testing in the morning. I was told the testing would take about a day and a half. I met my tester the next morning and we jumped right in. First things first, he wanted to make sure I was a safe driver and a good shifter, so we went straight out for the road test. Now, I had never driven a big rig before I went to CDL school, and after only driving for a little over a month I felt pretty confident in my abilities to pass a simple road test, that was, until we got into the truck. In my short experience, every truck drives and shifts differently. 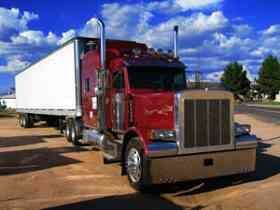 In CDL school, we practiced on a 1991 Freightliner with a 10 speed. The transmission was so wore out, you couldn't really grind a gear if you tried. When I came to my orientation, we practiced in 2002-2004 Freightliner Centuries, which drove and shifted much different than my truck in school. Then I went out with my trainer, who has been with the company for 20 years, and had recently just picked up his new truck, a 2011 Cascadia, which shifted different than all the others. No problems I thought to myself, when I get back for testing I will get back into one of those Centuries again for testing. WRONG! We get out to the truck, I sit in the seat and BAM! I can't find any of the controls. This truck only has 95 miles on it, and is a Freightliner Columbia "glider". What is a glider? It is basically a brand new truck, except for the frame, drivetrain and rear drive axle's are all recycled from an old truck. I look at the tester with some disbelief in my voice, and he cuts me off, and says to relax, every truck drives different, you will figure it out. So out we head for the road test. After grinding a few gears and being a little embarrassed I finally found the right rpm range to be shifting at and got more comfortable. Nothing really exciting on the road test, drove thru some different streets and then headed back to the OC. After getting back I had to do a 45 degree alley dock, and then show how to properly uncouple the trailer from the tractor. After that we headed inside for the rest of the testing, and I had a huge sense of relief, because believe it or not, the driving is what worried me the most. They looked over my log books from the last 2 weeks to make sure I knew how to properly fill them out, then set a trip plan in front of me and told me to take my time, and come get him when I was done. I had heard horror stories about the trip plan, so I dove right in. Horror stories? I was done in like 20 mins.....so I double checked everything to make sure I wasn't missing anything. The tester comes in, looks it over and says "good job.....here is the rest, make sure you fill it out in real time!" The rest? What rest? I thought I was done. Here comes the horror! The next part was making the actual trip. It gave different scenario's that can happen while you are on the road and you have to explain what you need to do when they happen. I was working so hard on it I worked right through lunch without even realizing it! All in all it took me about 2 hours to finish, when I was done, I went to get a drink, and when I came back my tester had already come in and graded it. He pointed out some things I messed up, and showed me how to fix them. My brain was hurting and I can see how some people fail it. Ist definitely tests your math and critical thinking skills. After that, the rest of the day was watching video's and doing some computer based training. I actually got done with everything right around 5 pm (cause I worked through lunch on accident), but my tester encouraged me to stay there for the night instead of driving back, because he wanted me to speak with my driver business leader before leaving. So the next morning I contacted my driver business leader to let her know I was done with my training. We had a brief chat and she told me she would start immediately to find me a truck. In the meantime, she wanted me to go home, and she would contact me either later that day or the next day with information on where and when to pick up my truck. So, here I sit at home, waiting for the call, and when it comes, I will be out on the road solo! Omnitracs (a.k.a. Qualcomm) is a satellite-based messaging system with built-in GPS capabilities built by Qualcomm. It has a small computer screen and keyboard and is tied into the truck’s computer. It allows trucking companies to track where the driver is at, monitor the truck, and send and receive messages with the driver – similar to email.